Kayley Rachel (5th grade) from Texas wanted to know if temperature made a difference in the strength of magnets. She researched her question and came up with an experiment to answer her question. What do you think? Is a hot magnet stronger or weaker than a cold magnet? Read her science project "Hot on Magnets" to find the answer. Kids Activities Newsletter and we'll send you a link to our Kids Activities Library filled with kids crafts ideas and science projects to keep your children happy and busy! Or check the Free Activity Library for kids crafts and children's activities. Science project due? Take a deep breath of relief. You've found your experiment! Stop wasting time Google-ing for an idea. Why start an experiment with hard to follow instructions that might not work? Avoid that long list of expensive, hard to find materials. These science fair projects will help your child get the very best grade. Hang the Wheel of Better Behavior on your kitchen wall, and the atmosphere in your home will change overnight. It's guaranteed! Watch the dramatic changes as homework gets done, clothes get picked up, arguing stops...in short, the Wheel produces great kids and a stress free environment! The mere presence of the Wheel will have a marked effect on your kids. Chances are, you'll seldom even have to spin it! Question: Does temperature affect the strength of magnets? The hypothesis of my experiment is that temperature extremes (0 degrees Fahrenheit and 210 degrees Fahrenheit) will reduce magnetic strength, when compared to magnetic strength at room temperature (about 72 degrees Fahrenheit). Count out 300 bb pellets and put them into the glass. First, bake a magnet in the oven (210 degrees Fahrenheit) for one hour. Then, put the second magnet in the freezer (0 degrees Fahrenheit) for one hour. Don�t do anything to the third magnet so it remains at room temperature (70 degrees Fahrenheit). Attach the screws magnetically to the flat surface of the third magnet with the sharp part facing upwards and dip the magnet into the glass holding the screw by the sharp part. After five seconds, slowly pull the magnet straight up and count the bb pellets that are left in the glass. Subtract the number from 300 and record the data. When the first and second magnets are done baking and freezing, perform step three with them. After thirty minutes, repeat the experiment. Find the average of the number of bb pellets each magnet picked up. The unchanged magnet picked up the most bb pellets, with an average of 215 of them picked up. The frozen magnet picked up the second most, with the average of 192.5 bb pellets picked up, about 10% less than the unchanged magnet. The baked magnet picked up the least, with 174 bb pellets as an average of bb pellets picked up. That is about 20% less than the unchanged magnet and almost two times less than the frozen magnet. The unchanged magnet was the strongest magnet of the three magnets concluding that temperature does affect the strength of magnets. I found that the freezing and baking of the two magnets reduced the strength of the magnet by about 10 to 20%. Heating the magnet decreased the magnet�s strength the most because the hot magnet picked up almost two times less than the frozen magnet. I found that adding the two screws to the magnets as handles seemed to increase the magnet�s strength. As a result, the screws and the bb pellets the magnet picked up had magnetic charge. So I had to wait a little while before conducting the experiment with another magnet. When I did the experiment I found out that I had to change some things on the procedure. I removed some materials that I didn�t need, and added the ones that I needed. I had to do the experiment twice to find the right information that was needed. After performing the experiment again, I found the average of bb pellets each magnet picked up. I learned that it takes a lot of time and patience to conduct a successful experiment. More information on the science of magnets. Creative Kids at Home has checked every weblink on this page. We believe these links provide interesting information that is appropriate for kids. However, the internet is a constantly changing place. You are responsible for supervising your own children. If you ever find a link that you feel is inappropriate, please let us know. Includes Magnet Wand, block magnet, two disc magnets, two "doggie" magnets, one metal-encased magnet, magnet viewing film, flexible magnet, wood dowel, shoelace and activity booklet. Ages 6 & up. 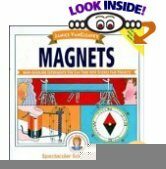 Janice VanCleave's Magnets: Mind-boggling Experiments You Can Turn Into Science Fair Projects.